I love to get every child to realise they can draw, especially those that say they can't! Illustration crosses curriculum boundaries and the workshops are suitable for children of all ages and abilities, and also reach children who don't have English as a first language. I'm very flexible and am happy to give assemblies. I've curated, given talks, readings and workshops at Festivals,Museums and Libraries. Any age , from nursery to adult learners, depending on the type of session, but mostly Primary School ages. Preferably 3 per day, with an additional assembly to include and involve the whole school, but can be discussed with the school. Workshops usually minimum of 90-120mins, but all of this is open to discussion with each individual school. I'm London based, but am prepared to travel anywhere if travel and accommodation expenses are met. • Innovative and creative in the range of Summer Reading Challenge (SRC) reader development events and activities organised for children aged 4 – 11. This is a national annual reader development programme in libraries to support continued literacy and learning development during the summer school holiday. Karin’s workshops have combined story telling with fun, enjoyable art workshops. She has successfully tied in her workshops to the annual SRC programmes such the 2009 fantasy theme Quest Seekers, 2010 cosmic theme Space Hop and 2011 entertainment theme Circus Stars. • Good communication skills and relates very well to children and family learning groups and is committed to improving literacy development. She reads a wide range of literature for children and young people and is always keen to keep up to date with new books as well as changes in the national curriculum. • Enjoys the challenge of new projects, is progressive and seeks solutions and continually looks at ways of improving service provision. • Committed to supporting learning and promoting a lifelong love of books in children, young people and their families. Karin is a reliable and very responsible person who cares passionately about reader development service provision to children and families and how they can develop a lifelong love of reading. She is conscientious, enthusiastic, organised and methodical, and responds well to new challenges. I am currently teaching at a school in Barnet and although I have only been there since September, I have already recommended Karin to the Head Teacher. I do so because I know that Karin is able to get amazing results from children of all ages; because she inspires them to look beyond the pen and ink and consider the thought processes that informed the final product; because she delivers consistently no matter what the task, objective, age range or venue; because the children learn without realising that they are learning, in a cross-curricular way. But most of all, because I know that children love working with Karin and it is evident to all who observe her that Karin clearly loves working with them. You won’t need me to tell you what a gifted artist and author Karin is. Her beautiful books speak for themselves, as does the critical acclaim she’s received and the awards she has won. Working with her editorially is a joy: her work comes from the heart and she cares deeply about every word, and the effect it will have on her reader. Outside of the studio, Karin works energetically on events of every kind, from the UK’s major literary festivals to workshops in schools and libraries. I can’t count the number of events that she’s been involved in during the three years that I’ve known her. As an author–illustrator, she brings the best of both worlds to her work with children. Her passion and knowledge, both about books and how to engage and stimulate her young audience, are clear to anyone who has seen her in action. 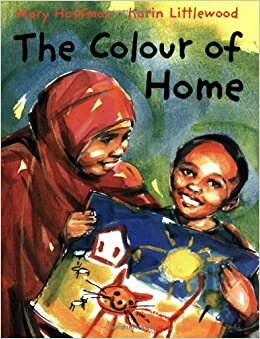 "The Colour of Home" by Mary Hoffman which Karin illustrated, was chosen as one of the Diverse Voices Top 50 book list , which champions Britain's rich, cultural diversity from the 1950's to the present day . The Guardian wrote "culturally diverse books to read, savour and recommend - a joyous celebration of the 50 most fabulous books for children of all ages living in multiracial, multicultural UK today"